This application is for proposals for exhibits in the Waller-Yoblonsky Gallery (WYG) for the Spring 2017 semester. The WYG is located in the Melvin Graduate Studios at 2998 West Lincoln Street and is a great space for experimentation. Each show will have a reception to celebrate the work on view. Proposals can be for group exhibitions, class exhibitions or use, or solo exhibitions. MSU students from all departments and schools are welcome to submit proposals, as are members of the general public. Submissions are due by December 9th at midnight and winners will be announced by January 31st. If you do not receive an email in reply, please understand that your work was not accepted. There is a $10 non-refundable application fee to enter a proposal. Everyone is allowed to submit a proposal for an exhibition, including the general public. What types of artwork do you accept? Any medium of artwork is acceptable. The artwork must be finished and ready for installation. If your artwork requires specialized equipment (i.e. headphones, screen, special installation hardware, etc.) you must provide the equipment along with your submission. Please do not submit any work that is not ready for install; for example, charcoals drawing that are not fixed, wet paintings, or works that are being exhibited elsewhere. All paintings must have a proper hanging device (ie, wire, French clip, etc.) Sticking a work of art on a nail is not acceptable and is unprofessional. Unless you have prior authorization from the Gallery Director, lack of a proper hanging device will disqualify the piece from jurying. Applicants should submit the following documents: an artist statement (maximum 1000 characters); an image list that corresponds with submitted works, and if needed a proposal including install needs (max 4000 characters) . Please submit each document separately as a Word document or a PDF. In addition to the documents, please submit 8-10 images or A/V files. Images should be a maximum of 1200 x 800 pixels and audio or video clips should not exceed 2 minutes each. Accepted formats are JPEG, TIFF, PNG, MP3, MP4, WAV, and MOV. Does my 2D artwork need to be framed? Although framed artworks are preferred, unframed work will be accepted only at your own risk: unframed work is prone to damage and the gallery will not accept responsibility for any damage to unframed art. May I submit an audio or video piece? Absolutely! Audio and video pieces are always welcome. See requirements above. CLICK THE LINK BELOW TO SEE FLOOR PLANS! 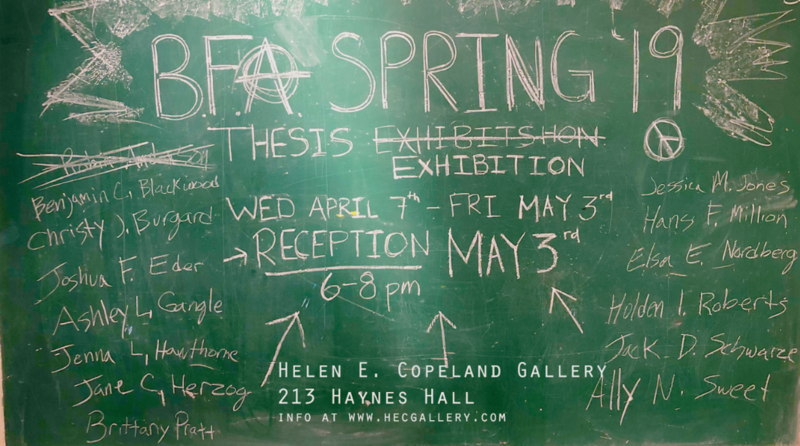 Next postBFA Fall Thesis December 1st – 16th at the HECG! !